This article discusses how Don Norman’s Principles of Discoverability could improve the iOS experience for senior citizens. I breakdown each of Norman’s 6 principles and how particular elements of iOS relate feature discoverability. Thanksgiving was a time of joy and family revelry — a day spent shoving my face with turkey and gravy at noon, followed by football. Then to top off the night the family played blackjack and flip cup… except for me. I spent the night teaching grandma how to use her iPhone. Despite having the device for a few years, many of the features went unnoticed, or she just accepted the fact she wasn’t tech savvy enough to figure it out and accepted confusion. I saw this as the perfect opportunity to do a little study in User Experience. I take a look at how Don Norman’s principles of discoverability can help my grandma use her iPhone. For a little over an hour I asked my grandma to complete certain tasks. I asked her to guide me through how she uses her email, how she uses facebook vs facebook messenger, and what apps she used most frequently and why. I saw her apps were scattered so I asked her to rearrange them. She had little to no home screen organization, with many apps I assumed she didn’t use, so I asked her to delete the ones she didn’t want. I tried my best not to intervene while she worked through these processes. These seamingly simple tasks stumped grandma; I’m not too sure she even knew many of these tasks were things she could do. I reassured grandma that her failure was no fault of her own — iOS just made some potentially confusing design decisions. Those confusing design decisions confronting my grandma can be attributed to key design elements — Interaction Design & Discoverability. Interaction Design is the design of interactions between users and products. Good Interaction Design requires the product to accommodate the user’s behavior. More specifically, the user must be able to quickly and easily build a mental model of the product through discoverability. 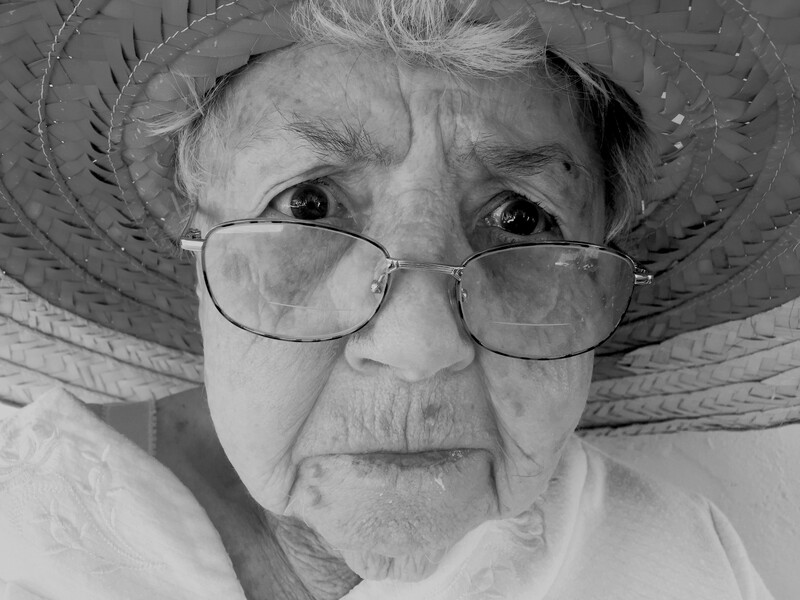 In this scenario, Interaction Design involves the many methods a senior citizen uses when interacting with an iPhone. The level of discoverability as to how a senior would interact with their phone determines whether or not a senior can build that mental model, thus providing them with good interaction design. 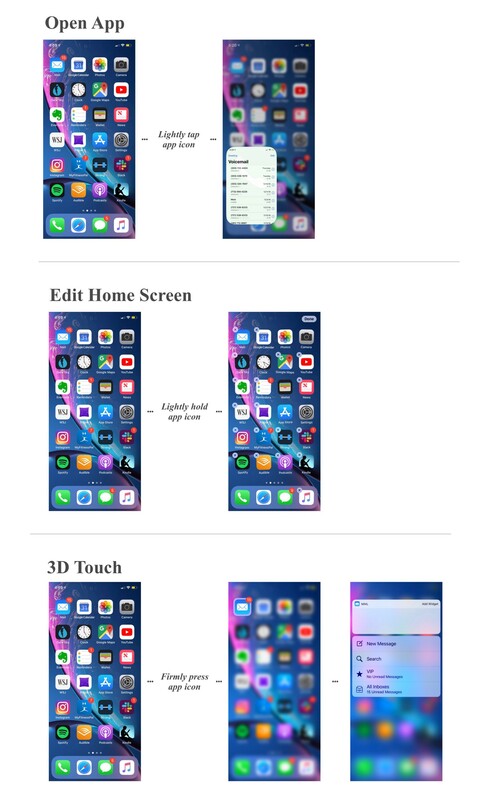 The image below shows how convoluted mobile interaction can be, and this doesn’t even include the primary frustration my grandma faced — iPhone’s 3D Touch. These modes of interaction may seem simple to the common user and provide advanced functionality on a phone lacking a mouse and large screen real estate; however, these advanced gestures often ignore seniors and make common tasks more difficult — poor discoverability. For example, there are 3 main ways of interacting with an app icon on the home screen. 1) You can open an app by simply tapping the app icon. 2) You can rearrange your apps by tapping and holding (not pressing) which causes all the icons to jitter, or 3) you can hard press the app the view app shortcuts. My grandma does not have great dexterity. When she wants to open an app, she presses down as if she’s clicking a tangible button. Prior to 3D Touch this action worked flawlessly. Although, with the addition of 3D Touch, the differences in activating these 3 different states is more subtle — making it harder for someone like my grandma to accurately distinguish between the different levels of pressure she’s applying. I fixed this issue by simply turning 3D Touch off. However, this reveals the main problem iOS has with interaction design in regards to senior citizens. Interacting with a digital device requires seniors to build a mental model of an intangible system. Without proper communication and instruction, building this mental model can be confusing and difficult. Senior users are required to discover and memorize these hidden areas or features within iOS. The solution? Fortunately, we can look to one of the founding fathers of UX Design, Don Norman, for the answers. Norman lays out the basic principles of discoverability: Affordances, Signifiers, Constraints, Mappings, Feedback, and Conceptual Models. Affordances determine what actions are possible. For example, when you pick up a pair of scissors it’s immediately clear how they should be used. The ergonomic grip and pivot point between the grip and blades communicates one intended function — cutting. How can this be applied to iOS to help seniors? iOS’s current use of affordances is scarce. When you pick up the phone (aside from the initial intro tutorial) there is no clear indication as to what modes of interaction do what. Control Center, Notifications, Widgets, and Search are all hidden. With advancements in machine learning, iOS could in fact monitor what features are not being used the most by users. If an elderly user isn’t using notifications (because perhaps they’ve forgotten how to access it) then iOS could prompt the user of its existence and provide the user with an optional tutorial on the subject. Signifiers determine where the action should take place. Much of the functionality in iOS is hidden so more pronounced signifiers could assist seniors with utilizing these functions. iOS currently has two good examples — the bottom bar on iPhone X that allows you to return to the home screen and the bar on the upper right-hand corner of the lock screen that prompts one to swipe down for command center. 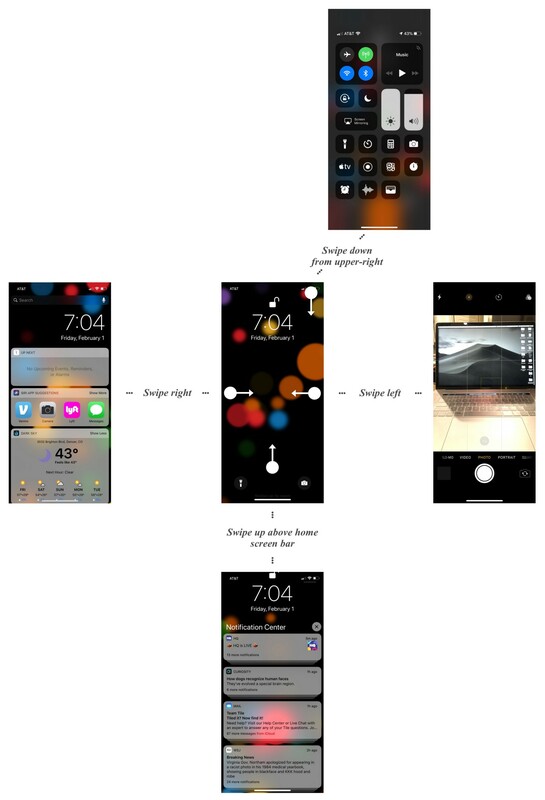 Increasing design elements such as these, and adding some animations and more bold colors, could better signify to senior users what areas of the device they can interact with. Constraints limit the possible ways a user might interact with a product. This is especially crucial when designing for more senior users. Luckily, many of the gestures or touch inputs, i.e. 3D Touch, can be disabled through accessibility settings. iOS also has an advantage over Android since iOS limits potentially confusing customization options. However, iOS could very well limit more of these interactions by default. For example, Reachability (a feature that allows you to more easily access items at the top of the screen while using one hand) is a great feature, but is turned off by default. iOS could very easily use a user’s date of birth to determine whether they qualify as a senior user, and walk them through some of these accessibility options. Mappings provide a clear relationship between cause and effect of an interaction — i.e. if a scrollbar is halfway down the page, you’re halfway through that page. iOS does a relatively good job at this. iOS’s use of a navigation panel on the bottom of apps (as opposed to Android’s use of the hamburger menu) gives users a clear indication of the primary features within apps and where they are in the interface. Additional increases in contrast and boldness for these features could further improve iOS’s use of mapping, such as improving the visibility of the screen indicator on the home screen. Feedback lets the user know an action has taken place, and whether that action failed or succeeded to do what was expected. iOS’s use of haptic feedback is a great example of how feedback is used well. Similar to what was suggested above in Affordances, iOS could further personalize feedback according to the user, such as alerting a senior user about hidden features. A conceptual model is the memorized picture of how a system should consistently work. Inconsistent design patterns make it difficult to build these models. For example, if you want to view notifications on the lock screen you scroll up. If you’re on the home screen, you have to swipe from the upper-left hand corner — which essentially takes you back to the lock screen. Also, figuring out where to view the time and date is a mixed bag. 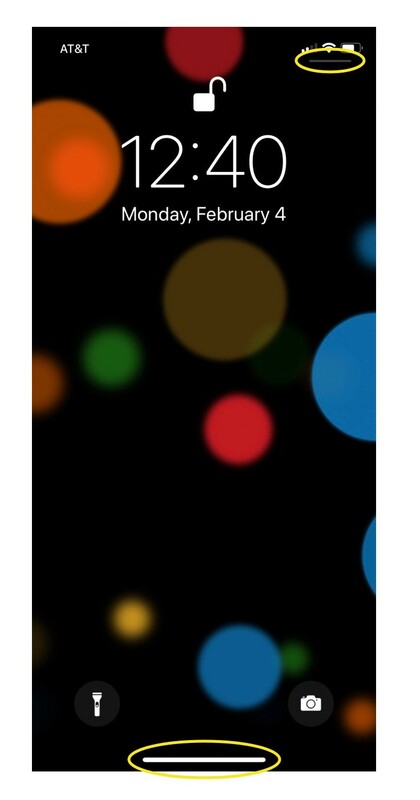 You can view it on the lock screen or the lock screen’s widgets panel. However, you can’t view it from the home screen’s widgets panel, nor can you view it from the control center from either the lock screen or home screen. Consistent design patterns are key when designing for seniors. Android’s search and notifications do a great job of limiting the complexity of its Conceptual Model. 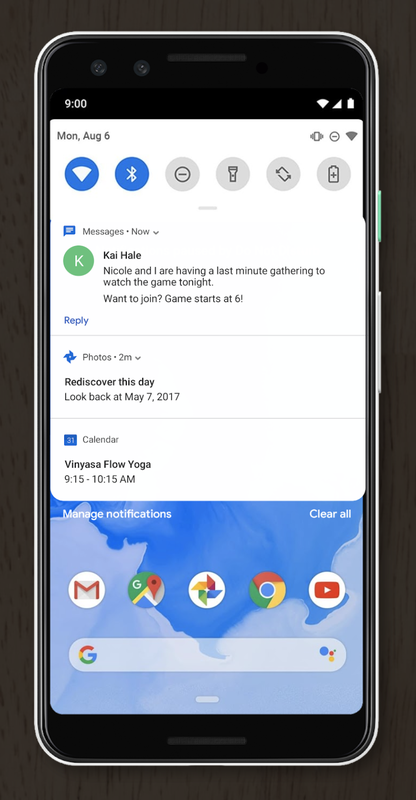 Both notifications and Android’s equivalent of iOS’s Control Center are included in a notification drawer that’s accessible from the top of the screen. This similar simplification could be applied to iOS. 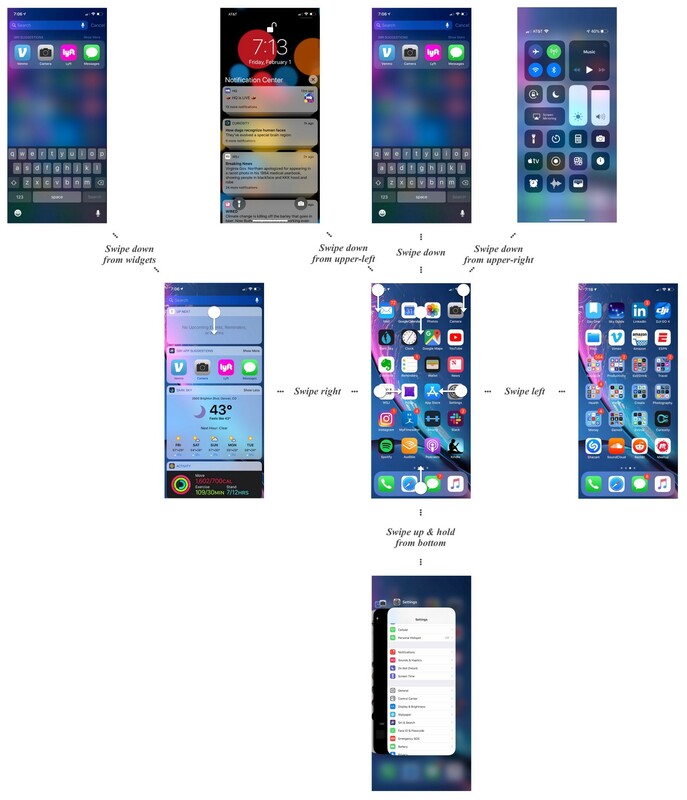 This particular example could go far with assisting seniors in building a Conceptual Model of iOS’s many screens. All-in-all these principles call for clear and simple communication. Apple does a wonderful job implementing accessibility features. iOS’s only barrier to truly good UX for seniors is the discoverability of these many features. Simple design changes can better communicate to seniors the many features they have at their disposal. My grandma would deeply appreciate some enhanced discoverability.